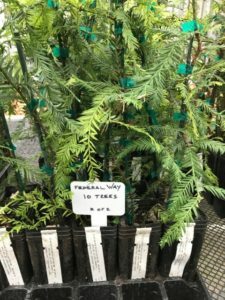 Coast redwood saplings were delivered to Federal Way on January 17, 2017. 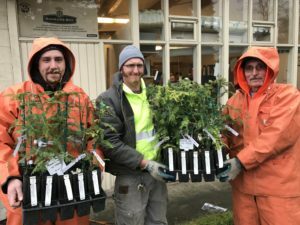 Josh Dove, left, Ernest Fisher, middle, and Gary Neiffer of the Federal Way Public Woks Department accept delivery of redwood saplings for Federal Way Parks on a very rainy day in January. 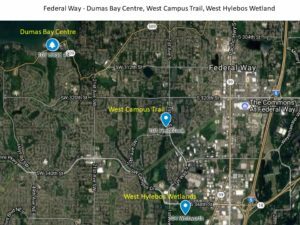 This map of Federal Way shows the three parks where the redwood saplings were planted on March 27 & 28, 2017: Dumas Bay Centre, West Campus Trail, and West Hylebos Wetlands. 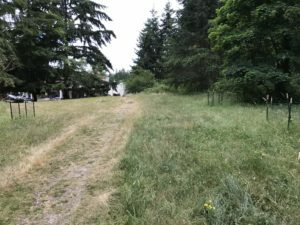 Dumas Bay Centre where four redwood saplings are planted. 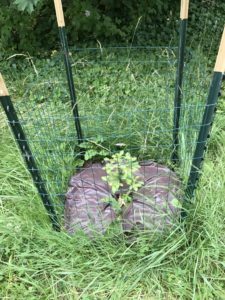 107 UCSC #4, one of four redwood saplings planted at Dumas Bay Centre. 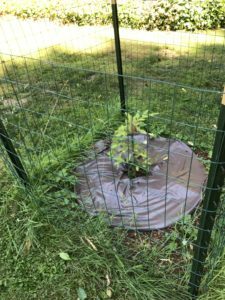 Three signs of a good tree planting are the fence protecting the tree from herbivores and mowers, mulch around the plant to keep weeds at bay and to retain moisture and a water bag to keep the tree watered during the dry summer months. 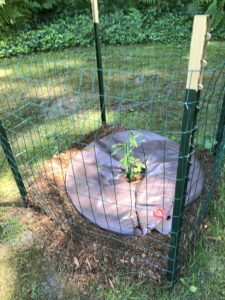 108 Murrish/Rope is the second redwood sapling planted at the Dumas Bay Centre. 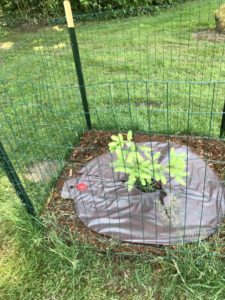 109 Huff is the third redwood planted at the Dumas Bay Centre. 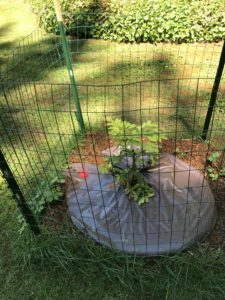 110 Mill Valley Inn #2 is the fourth redwood planted at the Dumas Bay Centre. West Campus Trail site where three redwood saplings are planted. 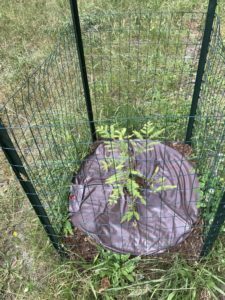 101 Fieldbrook is one of three redwood saplings planted at the West Campus Trail site. 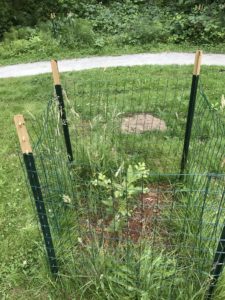 102 Wiedmann #3 is the second of three trees planted at the West Campus Trail site. 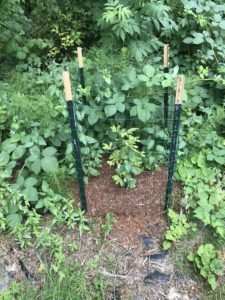 103 Kisling is the third of three redwood saplings planted at the West Campus Trail site. West Hylebos Wetlands park where the final three redwood saplings were planted. 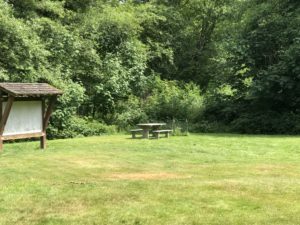 If you look closely, you can see one of the fenced enclosure of one of the trees to the right of the picnic table. 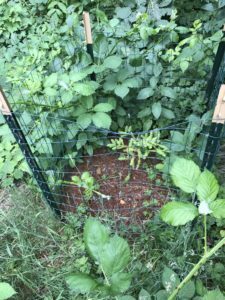 104 Whitworth was planted in the natural area, as can be seen by the blackberry plants nearby intruding into the fenced enclosure. 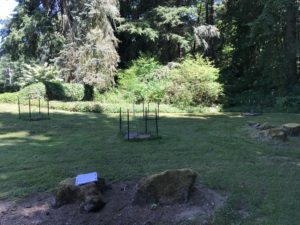 105 Dead Spire is the redwood sapling planted in the grassy area to the right of the picnic table. 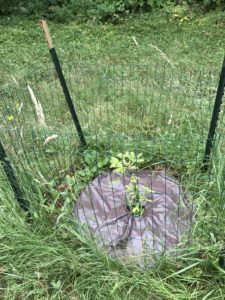 106 Barrett #2 is a third redwood sapling planted at West Hylebos Wetlands park. Ten coast redwood saplings ready for delivery to Federal Way in January 2017.